I can’t believe how fast this summer has flown by. We’ve been very busy here at the Windmill Inn with lots of guests from all over the world and US. It was fun talking baseball with George over a cup of coffee in the morning and why his Astros were doing so well. By the way George, I got your wish list done. Sitting out watching the meteor shower with Alex from France and discussing his families visit to Yellowstone. I thought for sure one of those meteors was going to hit the garage. I really enjoyed talking politics with Preben and the differences between the US and Denmark. Preben, sorry if I talked your ear off or asked too many questions, but I did enjoy our conversations. Enjoy Sweden this year! We’ve had our first taste of fall this year, a few cold nights and cool days, a herd of elk have moved down to the hay meadows, and Suzie heard a bull elk bugling. The season is winding down so hopefully I’ll be more proactive about keeping this blog going, unless we go fishing, camping, critter watching in the park, hunting, or a round of golf. The blog might suffer until winter sets in…. 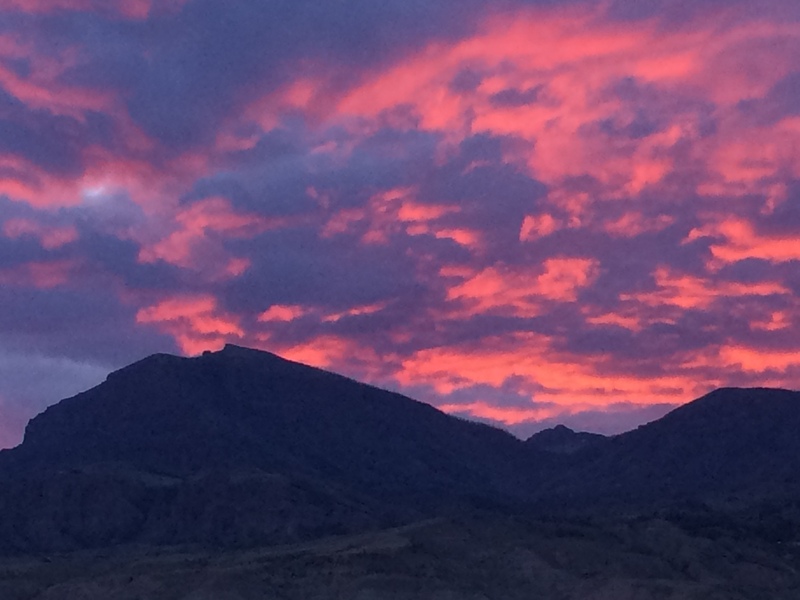 The picture above is a recent sunset above Jim Mountain, one of many spectacular sunsets here in the Rocky Mountains of Wyoming.